Summary: We report two cases of aneurysm of the distal branches of the superior cerebellar artery presenting with cerebellar infarction. In both cases, the diagnosis required close correlation of the findings from different imaging techniques, as catheter angiography failed to opacify the lesions. In one patient endovascular parent vessel occlusion was performed, whereas in the second patient the aneurysm thrombosed spontaneously. We describe the clinical and radiologic presentation of these aneurysms and discuss their pathogenesis, diagnosis, and treatment. Aneurysms involving the peripheral portion of the superior cerebellar artery (SCA) are rare (1) and usually present with subarachnoid hemorrhage (SAH) (2, 3) or fourth nerve dysfunction (4–7). We report two patients with peripheral SCA aneurysms who presented with cerebellar ischemic events without SAH. Correct diagnosis was not readily made from selective angiography. Ten weeks after an uncomplicated delivery, a 27-year-old otherwise healthy woman, with no history of head trauma, had progressive onset of occipital and temporal headache. The day before admission she experienced numbness of the left side of her body, including her face, and slurred speech. Physical examination revealed mild hypoesthesia of the left inferior limb, painful hypoesthesia of the left side of the face, and slight left hyperreflexia. Initial unenhanced and enhanced CT studies showed a well-delineated 1-cm spontaneously hyperdense lesion with minimal enhancement located above the cerebellopontine angle (Fig 1A). There was no evidence of SAH. Hypodense foci suggestive of recent ischemia were visible in the right SCA territory. Left vertebral angiography showed sluggish flow within the right SCA but no aneurysm (Fig 1B). Supraselective injection of the right SCA (Fig 1C) revealed a fusiform aneurysm of the distal hemispheric branch of the SCA with distal occlusion of the branch. Owing to the possibility of spontaneous dissection, with potential risk of rupture, endovascular parent vessel occlusion was elected. A Fastracker-10 double-marker catheter (Target Therapeutics/Boston Scientific, Fremont, CA) was used to catheterize the aneurysm over a 0.010 guidewire (Terumo Corporation, Tokyo, Japan). A 2- × 8-mm Guglielmi detachable soft coil (Target Therapeutics) was delivered partly inside the aneurysm and partly into the parent artery. An immediate control angiogram (Fig 1D) showed total occlusion of the aneurysm and parent artery. The patient's condition improved, including resolution of the headache and of the left-sided hypoesthesia. An MR examination repeated 2 years later (Fig 1E) showed virtually complete disappearance of the aneurysmal mass. 27-year-old woman with progressive onset of occipital and temporal headache. A, Contrast-enhanced CT scan shows a well-delineated spontaneously hyperdense lesion with minimal enhancement located above the right cerebellopontine angle. B, Left vertebral selective angiogram (anteroposterior view) shows slow opacification of the right SCA (arrow). C, Right SCA supraselective injection shows the fusiform aneurysm of a distal hemispheric branch (arrow). D, Same injection as in C after embolization shows obliteration of the aneurysm along with its parent artery (arrow points to the coil inside the aneurysm). E, T2-weighted MR image 2 years after treatment shows the low signal intensity of the coil and almost complete disappearance of the mass. A 49-year-old man presented with a 2-day history of dizziness, slurred speech, right-hand incoordination, diplopia, and mild headache. He had no relevant medical history except for hypertension. There was no history of head trauma, although he reported a precipitous traumatic birth. Physical examination was within normal limits except for right-sided fourth cranial nerve palsy and slight right dysmetria. An initial enhanced CT scan (Fig 2A) showed a 7- × 7-mm round, hyperdense lesion in the ambient cistern suggestive of an aneurysm, and hypodensities in the right cerebellar hemisphere consistent with a recent infarct in the SCA territory. There was no evidence of SAH. MR imaging, performed the day after admission and 1 month later (Fig 2B), disclosed typical signals of blood degradation products within the lesion. 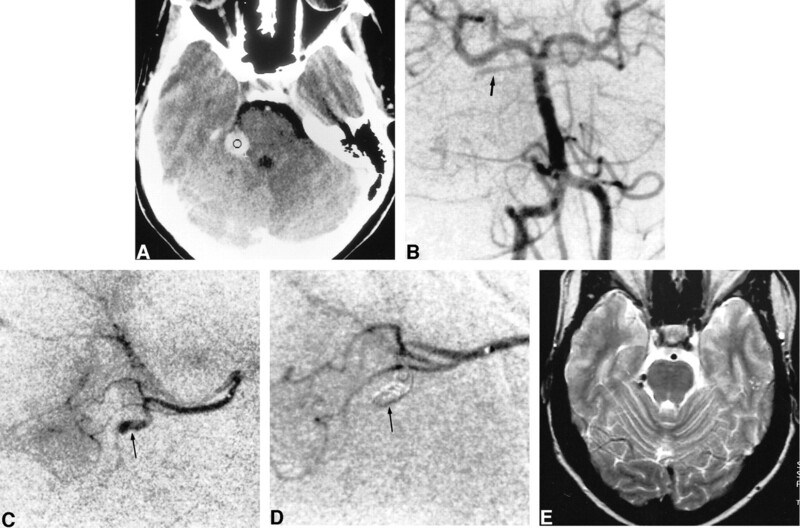 Initial MR angiography revealed an absence of flow in the right SCA and no aneurysm, suggesting that the lesion seen on the CT scan was an already thrombosed aneurysm. MR images also showed three small cystic lesions on the right side of the midbrain with no edema or mass effect, as well as a recent infarct in the right SCA territory. Two vertebral angiograms were performed within a 10-day interval. Both angiograms showed complete occlusion of the right SCA at its origin (Fig 2C). Three months later, the patient still had fourth nerve palsy. MR follow-up at 10 months showed disappearance of the mass lesion (Fig 2D). 49-year-old man with 2-day history of dizziness, slurred speech, right-hand incoordination, diplopia, and mild headache. A, Contrast-enhanced CT scan shows an enhancing well-delineated extraaxial mass in the right ambient cistern. Cystic lesions are also visible within the right midbrain (arrow). B, Left vertebral selective angiogram (anteroposterior view) shows complete occlusion of the right SCA at its origin (arrow). C, Unenhanced T1-weighted MR image 1 month after presentation shows high signal intensities consistent with methemoglobin, which was also visible on T2-weighted images (not shown). Cystic lesions of the midbrain are also visible (arrow). D, T2-weighted MR image 10 months after presentation shows disappearance of the mass. Cystic midbrain lesions are well shown. Most distal SCA aneurysms present with SAH (2, 3). Although rare, peripheral SCA aneurysms presenting with ischemia should be recognized to prevent SAH from an undiagnosed lesion. Distal posterior circulation aneurysms may have distinctive clinical features in accordance with their location. 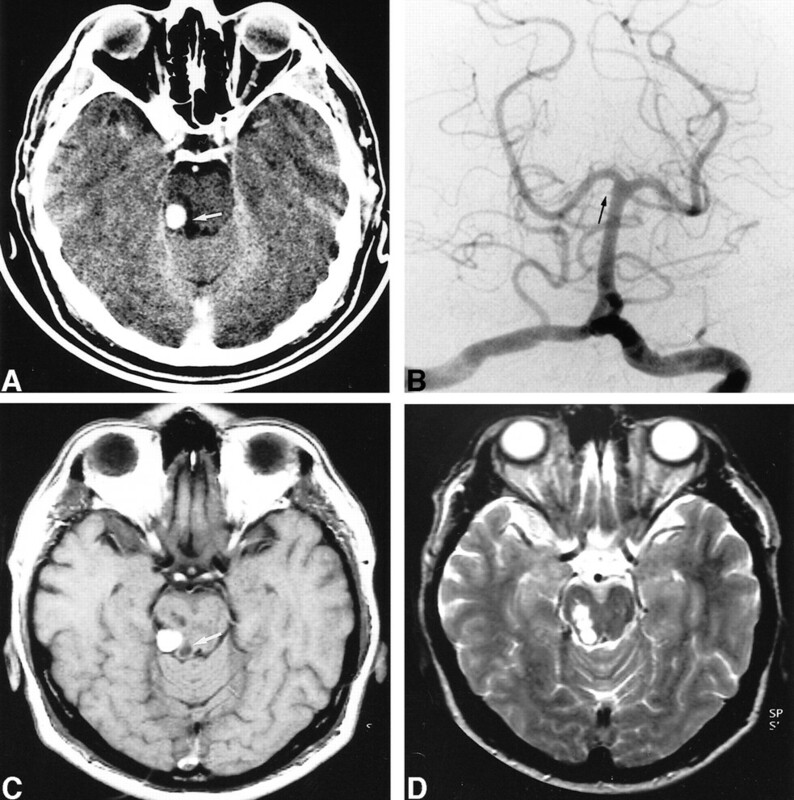 Five cases of trochlear nerve palsy due to peripheral SCA aneurysms have been reported (2, 4–7). The trochlear nerve, located beneath the tentorium, is vulnerable to injuries related to aneurysms involving the nearby posterior cerebral artery (P2 and P3 segments) or to SCA (8). One case has been reported in which the initial sign of presentation was isolated fourth nerve palsy without SAH (5). To the best of our knowledge, there have been no reports of patients with SCA aneurysms presenting with a primary ischemic event without hemorrhage. In both our cases, cerebellar ischemia was evident on CT and MR imaging studies. Thrombosis with or without distal emboli originating from the aneurysm was considered to be the mechanism of cerebellar ischemia. The clinical manifestations were mild, and both patients recovered completely. Aneurysms arising from peripheral segments of cerebral arteries may be congenital, but they are often reported as traumatic, mycotic, or associated with an arteriovenous malformation (2, 9). Traumatic false aneurysms usually involve the distal cerebral circulation, and fewer than 10% are located in the posterior circulation (3). Six cases of traumatic aneurysms involving the SCA have been reported (3, 10–13), including one case of distal aneurysm of the SCA in a 5-day-old infant who presented with SAH after a traumatic birth that necessitated forceps delivery (12). The SCA may be particularly vulnerable to injury caused by stretching of the edge of the tentorium (7). In case 2, a history of precipitous birth with forceps delivery was the only traumatic event reported by the patient. The presence of cystic lesions on the right side of the midbrain with no clinical manifestation led us to speculate that an injury of the right SCA may have occurred at the time of birth with the ensuing development of a false aneurysm that finally presented with thromboembolic complications. The cystic lesions would then represent encephalomalacia, most probably related to ischemic injury on the territory of the perforators of the SCA. While 85% to 90% of intracranial traumatic aneurysms become symptomatic within the first 3 weeks (3, 14), delayed onset of clinical presentation years after the head trauma has been reported (15). Delayed rupture of traumatic aneurysms of the aorta and arteries of the superior or inferior limbs has been described in the literature (16). In the absence of any history of trauma, as in our case 1, the distal site of the aneurysm, the young age of the patient, the postpartum period, and the angiographic fusiform aspect of the aneurysm may support the diagnosis of spontaneous arterial dissection. Increased laxity of vascular walls during pregnancy, combined with fluctuations of blood pressure and intracranial pressure during labor, may predispose to arterial wall dissection. Other hemodynamic, hematologic, and endocrinologic changes occurring during pregnancy are reported to predispose to aneurysm formation and rupture (17). In both our patients, although CT findings were highly suggestive of aneurysm, the diagnosis was not readily made from selective vertebral angiograms. In case 1, sluggish flow was visible in the right SCA. Only a supraselective injection of the SCA allowed opacification of the lesion. In case 2, the right SCA was totally occluded at its origin on catheter angiography. The MR appearance, which showed degradation of blood products over time and involution of the lesion were the keys to diagnosis. An angiogram was repeated 10 days after the first one because of the known propensity of thrombosed false aneurysms to recanalize and the possibility of a false-negative MR angiogram caused by slow flow. This radiologic presentation underscores the importance of correlating the findings from different imaging techniques and of having a high index of suspicion. Therapeutic strategies for peripheral aneurysms depend on the relationship of the aneurysm to the parent artery. As mentioned above, most distal aneurysms are traumatic or mycotic in origin or fusiform in shape, and parent artery occlusion is generally required. Traditionally, surgical trapping was the primary method of treatment (18). Parent artery occlusion by endovascular embolization is also effective. This approach is less traumatic, and the quality of the collateral circulation can be readily assessed at the time of treatment. Collateral circulation between the SCA and both the posterior inferior cerebellar and anterior inferior cerebellar arteries allowing circulation in the distal branches of the SCA is generally efficient (18) in preventing significant infarction after deliberate occlusion, provided that the perforating and circumferential branches to the brain stem are preserved. In case 1, only supraselective injection revealed the presence of an aneurysm on the hemispheric branch of the SCA. Because of this angiographic finding, endovascular parent vessel occlusion was performed by transarterial embolization of the aneurysm along with its parent vessel using a controllable microcoil. Since anterograde flow was already compromised with evident collateral supply, formal test occlusion was not thought to be necessary. In case 2, thrombosis of the lesion and the absence of flow in the parent artery were established by MR imaging and angiography and no further treatment was necessary. A second angiogram was done 10 days later to ensure that there was no spontaneous recanalization of the parent artery. Follow-up MR imaging showed a decrease in the size of the lesion, confirming its nature and its resolving evolution. Our two cases of peripheral SCA aneurysms had clinical and radiologic features suggestive of false aneurysms. These aneurysms presented with cerebellar ischemic events without SAH. Precise diagnosis of the underlying disorder in this setting requires careful angiographic study with supraselective catheterization if necessary and close correlation with other imaging techniques. Endovascular treatment of peripheral SCA aneurysms is a safe and successful therapeutic approach. ↵1 Address reprint requests to Daniel Roy, MD, CHUM Hôpital Notre-Dame, 1560 Sherbrooke St East, Montreal, Quebec, Canada H2L 4M1.